I don't know anything much about astronomy so this seemed strange to me. If I can see the stars with my naked eye, what's to stop someone with a high powered telescope zooming in and getting good details? The reason, as I found out, is that stars are much, much further away than they look when viewed with the eye. The main reason for this is that every lens, including the human eye, has a limit to the resolution it can see. This is known as the 'diffraction limit' because once light travels through an aperture (in our case, our pupils), the waves spread out before hitting the detector (our retinas), blurring each point into what is called an Airy disk. For a human with 20/20 vision, the Airy disk is about an arcminute in size - so our sight can resolve something 1 inch in diameter from about 90 metres away. Every star we see looks 'blurred' to about this size - which is why all stars in the sky (except, once more, for the sun) look the same size. 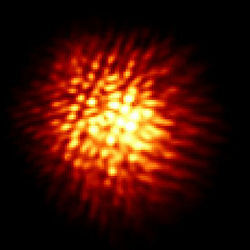 To be able to escape the diffraction limit, we need a much larger lens - which is why we use telescopes. However, once a telescope reaches about 10cm in diameter, another effect stops us from seeing the star - a phenomenon known as 'astronomical seeing'. This is the effect caused by variations in temperature and wind speed in the atmosphere causing the light to bend on the way to the receiver. The 'twinkling' that can sometimes be seen in stars is due to this effect, as the apparent position of the star moves with the constantly changing conditions in the atmosphere. At a good astronomical site, astronomical seeing will allow for a resolution of around 1 arcsecond. 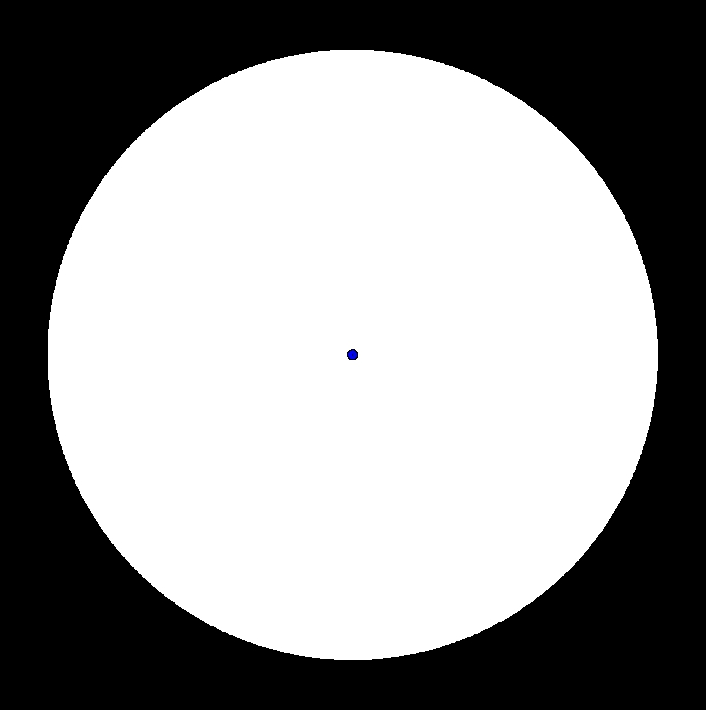 As illustrated above, this is roughly sixty times smaller (in blue) in length than human vision (in white) but even this is not enough to see a star. 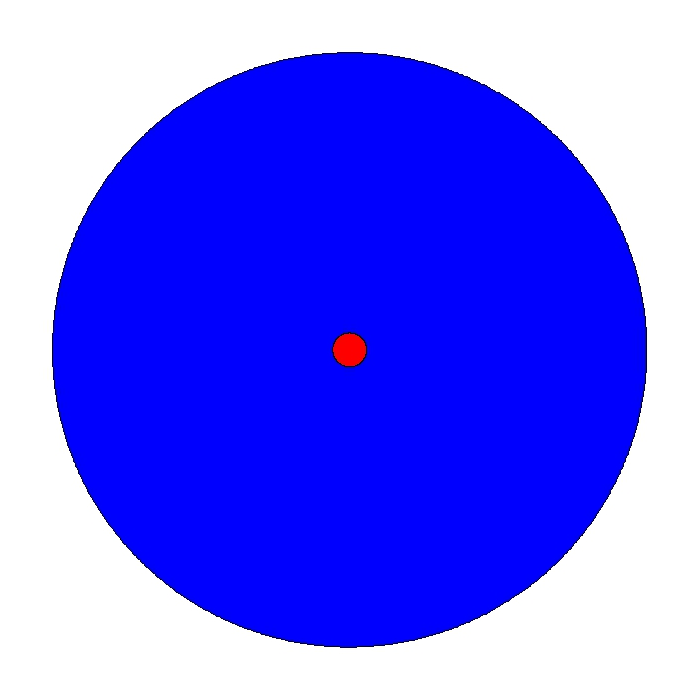 Below is the resolution with atmospheric seeing in blue again, but with R Doradus pictured in red - with a radius of 0.057 arcseconds. The only reason that ground-based telescopes are able to image R Doradus at all is by using adaptive optics - this attempts to compensate for the atmopsheric effects, and even this technology is currently only just enough to get a picture. A large enough orbiting telescope would get past both of these effects - the Hubble Space Telescope is still one of the largest with a mirror 2.5 metres in diameter*, which translates to a 0.05 arcsecond resolution for visible light: only just enough to see R Doradus. * the largest, the Herschel Space Telescope, has a diameter of 3.5 metres. Ahhh...now it makes sense! Very enlightening. Thanks!